BCA Research has just published a short note, highlighting the stark difference in policy response followed by Iceland and Ireland to remedy their debt malaise, in the absence of the Emerald Isle being able to devalue its currency. Their summary follows below. “Iceland and Ireland experienced similar economic illnesses prior to their respective crises: both economies had too much private-sector debt and the banking system was massively overleveraged. Iceland’s total external debt reached close to 1,000% of its GDP in 2008. By the end of the year, Iceland’s entire banking system was crushed and the stock market dropped by more than 95% from its 2007 highs. “Since then, Iceland has followed the classic adjustment path of a debt crisis-stricken economy: the krona was devalued by more than 60% against the euro and the government was forced to implement draconian austerity programs. “In Ireland, the boom in real estate prices triggered a massive borrowing binge, driving total private non-financial sector debt to almost 200% of GDP, among the highest in the euro area economy. In stark contrast to the Icelandic situation, however, the Irish economy has become stuck in a debt-deflation spiral. The government has no other options but to accept the €85 billion bailout package from the EU and the IMF. Source: BCA Research, December 2, 2010. After a crack IMF, EU and ECB team came to Dublin to crunch numbers with the Irish government, it appears that all sides have agreed on the need for a rescue deal to resolve the country’s continuing crisis in sovereign and bank debt. As a result, Ireland’s government has officially requested aid, and while the specific terms of the agreement are still being hammered out, the final package is expected to be €80-90 billion. Such an agreement and the acceptance of a sub-debt exchange by some Anglo Irish bondholders are only the first steps in a long, complicated and politically fraught process of sorting out the Irish banking system, implementing harsh fiscal austerity and digesting a welter of public and private external liabilities. Q: How much of Ireland’s public debt is held by non-residents? A: Around €80 billion, or 61% of GNP, according to the BIS, World Bank and IMF Joint External Debt Hub. Q: How much of Irish banks’ unsecured debt – sub and senior – is held by non-residents? A: We don’t know that specifically. We do know that external holdings of Irish Owned and Resident Bank debt are around €35 billion, or half of the total, according to the Irish Central Bank. Non-guaranteed, non-secured debt of the six big Irish “banks” is around €32 billion, according to Bloomberg data, although this is clearly a moving target. Q: What is the percentage of GDP of such unsecured – sub and senior – bank credits? A: According to the Central Bank of Ireland, the €35 billion of external holdings of Irish Owned and Resident Bank debt are around 22% of GDP and 27% of GNP. The €32 billion of non-guaranteed, non-secured debt of the six big Irish “banks” is around 20% of GDP and 24% of GNP, according to Bloomberg data. Q: Is the exchange offer for sub-debt working and/or accepted by most bondholders? A: On November 23, Anglo Irish Bank announced further progress in its sub-debt exchange offer. Investors holding 92% of its subordinated bonds maturing in 2017 have agreed to swap their debt for new notes. Holders of bonds maturing in 2014 and 2016 will vote on the offer on December 20, and three-quarters of each group of investors must vote to approve the exchange. But despite an earlier meeting that changed a specific, awkward clause and only needed a 50% acceptance, some investors in 2016 bonds claimed that they still control a stake large enough to block acceptance of the exchange and would do so at December’s vote. Q: We’ve been worrying about the government and banks, but what about the external balance sheet of other sectors? A: The external liabilities of the government are comparatively small, according to the Joint External Debt Hub. Whereas the banks dominate the short-term liabilities which, of course, are part of the current problem, the non-bank private sector has a substantial amount of longer-term external debt. Q: You and others often refer to BIS banking statistics, but don’t these include claims on foreign-owned banks located in Ireland? A: Yes, and this is one reason why we must be careful with the BIS data. 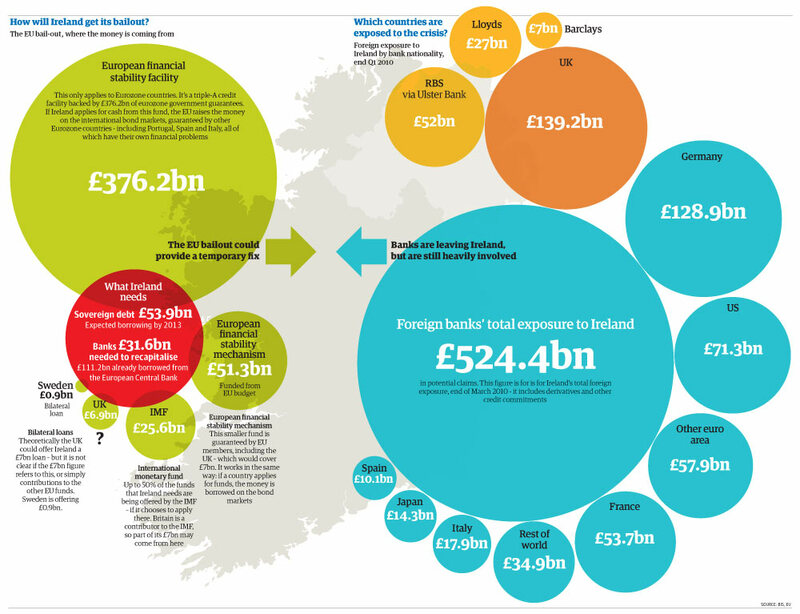 It is easy to overstate other countries’ exposures to Ireland and Irish banks. People must be attentive to what they mean by saying either “Irish Banking System” or “Irish Banks,” as the former is twice the size of the four big banks we’ve examined in detail. Q: Everyone keeps saying that German banks are most exposed to Ireland, followed by other European banks, but what does this mean? A: There are a few difficulties with using the BIS data to answer this question. First, although the BIS takes into account some risk transfers, for example, transferring claims from subsidiaries back to parent banks, this is not an exact science. Second, the BIS only regularly publishes data broken down by creditor country or borrowing sector, not both. Indeed, the German authorities won’t even tell other central banks the breakdown of both! Finally, the BIS publishes information about three off-balance sheet items that everyone seems to ignore because they are hard to understand. Derivatives are the gross positive value of derivative contracts between the BIS reporting banks and counterparties in Ireland. (Note that contracts with negative market values for the BIS banks are considered liabilities and thus ignored.) Guarantees are those given by BIS banks to counterparties in Ireland, including CDS contracts, so it’s quite ironic that they are effectively liabilities of the BIS banks. Credit commitments are loans contractually promised but not yet drawn. Source: RGE, November 24, 2010.